More than half (and climbing) of the world's population resides in cities. They propel a country's economy. However, traffic tends to suffocate urban areas. Important is to find faster ways of transit, at least to the people who matter and care. Change of regulations is up to aviation authorities. Adapting them will work as an enabler of one of the most exciting, new industries (like they do with regard to developing self-driving cars). Generally, countries don't want to miss out on them. 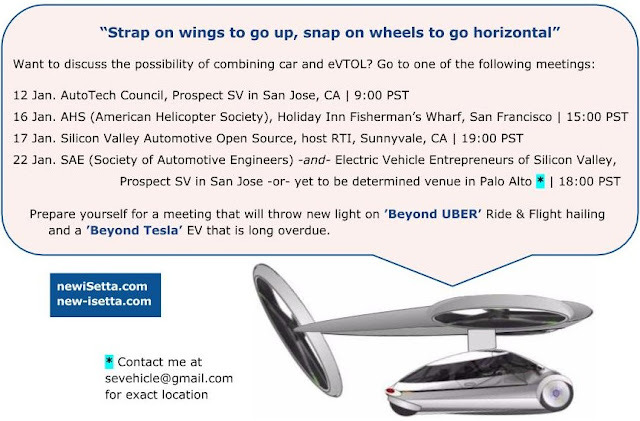 Click to see short intro on eVTOL's significance and potential. People have been fantasizing about flying cars for ages. Seamless transit through the air or by road, whichever suits your needs or time schedule, is the huge, unexplored void between regular air travel and using passenger cars. Talking about new market potential... Here's a very likely scenario. It's a scenario that may appeal to both the aviation industry as well as to car makers. ‘Flying cars’ take a lot of time, money and engineering to develop. No combination turned out satisfactory so far. Why don’t we see the sort of progress the telecom industry has made over the past decade? Too complicated? What options are there? (click). Contrary to helicopters, no pilot (license) will be required. With VTOL craft, personalized air travel can be a lot cheaper **, more practical, safer, brought close(r) to your point of departure and destination, less noisy than 'choppers', even take up less space than the cheapest helicopter ($288k) on the market does, the Robinson R22. Expect authorities to designate air corridors, probably running parallel to freeways. "Separate what goes up from what goes horizontally" has distinct advantages over fixed two-in-one contraptions like the (click>) Terrafugia concepts that aren't even supposed to have electric drive. - There’s always matching transport, literally, awaiting the customer. - It's a business model in itself. Chain-like. One that fits the way future transportation will be handled rather than be narrowly based on vehicle ownership - mobility-on-demand, network-embedded, provider-operated. Finally, a TNC's position in the market for personal transit can be enhanced beyond the use of a ride-hailing app. - Disk loading can be kept within tolerances (DL determines efficiency, downwash and noise level). What you see below, is less of a dramatic breakaway from the conventional than you might think. Piasecki is also hinting in this direction with its Ares concept for DARPA. CLICK HERE to see what I mean. 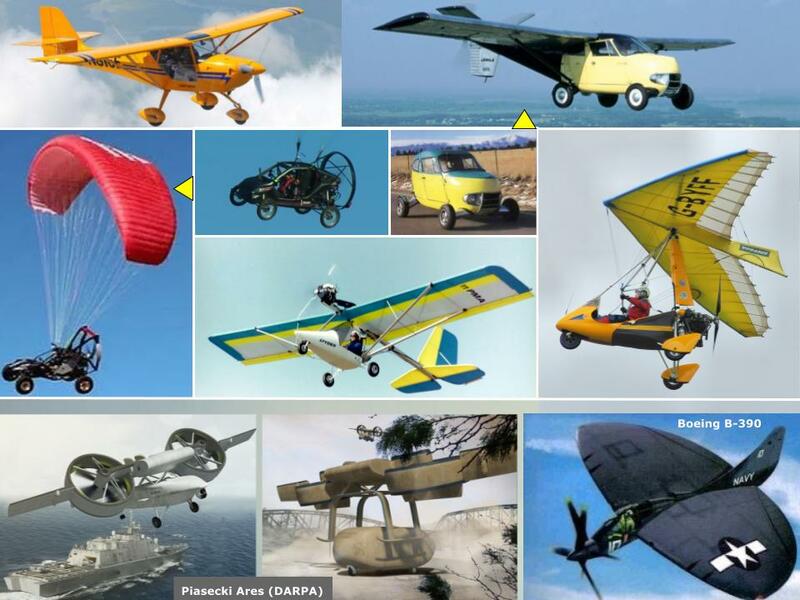 What is new, is the use of electric power, an airfoil to store batteries (instead of gasoline), the ability to vertically takeoff and land (VTOL), and the fact that a (semi) three-wheeler is used. Why? First of all, vehicle regulations. Secondly, it allows for a low-drag shape that tapers towards the rear (what you see here will need modifying of course). 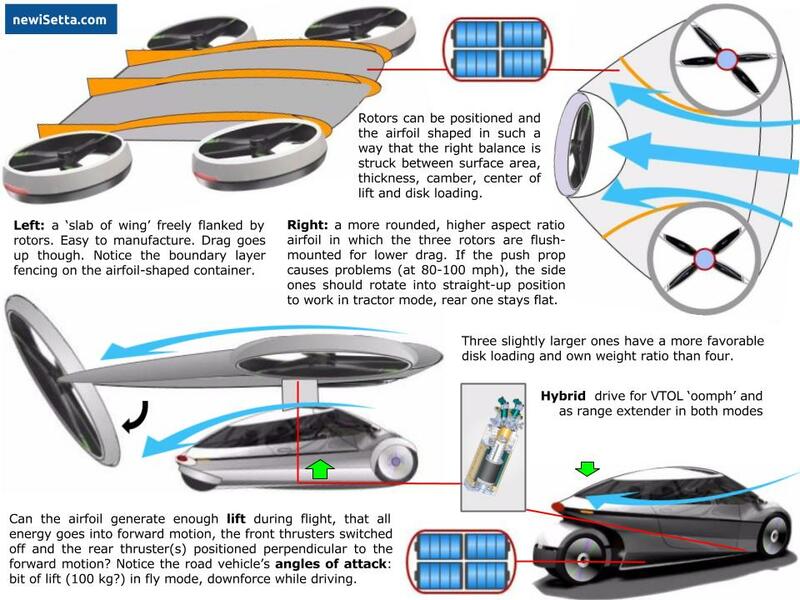 Below: 'recipe' for an eVTOL Flying Car ****. There's this universal principle: if a concept is basically simple (i.e. elementary) in its individual components and/or modules, development will be easier to benchmark, manage, verify, bring together. -1- Don’t integrate thrusters into an airframe, so they can be dimensioned, engineered and built to do what they do best: provide thrust. -2- Have an airfoil-shaped box provide lift during level flight. 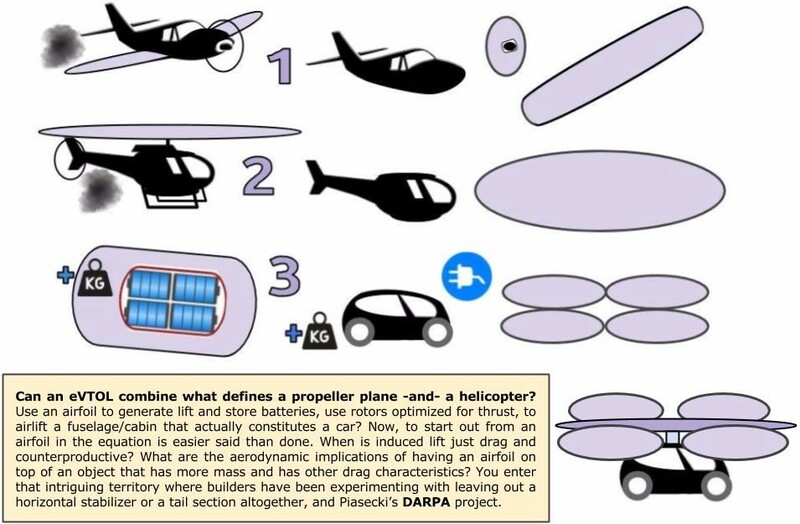 -3- You may not only get a 'Best of Both Worlds' between helicopter and small airplane, but also the chance to bring a true flying car, that can even add a bit of lift to the passenger compartment (fuselage) during flight to offset some of its weight, downforce in drive-mode (see green arrows in the above depiction). -4- In principle the concept depicted here can go as far as not needing variable pitch props, nor requiring control surfaces. CLICK HERE to continue story: "Will the electric car really take off this time? Part 2"
* Many new projects, such as SkyOpener, Mistrale, and MapKite are exploring new ways to use GNSS in aviation, with respect to Galileo and EGNOS (the EU’s GPS-overlay system), to determine both location and altitude. ** The cheapest helicopter on the market, the Robinson R22, typically costs $300 per hour to rent, so approx. $300 per 150 km (taking preflight etc. in consideration) or $2 per km. Mind you, that does not include hiring a licensed pilot. Uber reckons it will charge customers $0.32 per km on-board an autonomously flown eVTOL (according to CPO Jeff Holden in aerospacengineering.net). Click here for more info. *** You will need some sort of service point, no different than your local garage, tire station or rental car agency, to have the rotor assembly lifted off, checked, charged and stored away for the next customer. Best to combine this with heliports or vertiports, to begin with. The beauty of the system is being able to instantly drive off the moment you touch down, in a vehicle that's ideally suited for dense city traffic. No unboarding and walking towards a car on a wind-swept landing site. This modular system will require less space and less fuss than having separate VTOL crafts and separate rental cars or taxis, which is UBER's 'rooftop' vision. **** The electric car has come to a pivotal point. The benefits are obvious, but its high costs keep it from becoming popular! Denmark stopped subsidizing EVs, which resulted in a sharp sales drop. Will the U.S. be next? What Tesla did is make expensive, posh-looking heavyweights run on battery power. Next step should be making EVs cheaper to manufacture, buy and operate. Make EVs more appliance-like if you will. If you want to know why 'New iSetta' (preliminary working title) makes perfect sense as a self-driving, electric, ride-hailing vehicle, click here for a brief introduction. There were some skeptic articles after Uber's flying taxi plans became known. Influential Forbes in particular. Some eVTOL makers seem to complicate things. 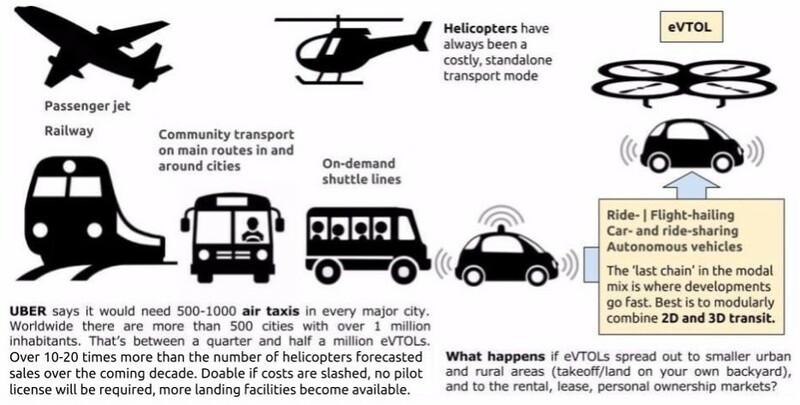 And helicopter manufacturers who want to cater to this new 'VTOL taxi' market tend to reinvent... the helicopter, which is as we all know an intricate piece of machinery and therefore expensive.